Bleacher Report Live is a handy streaming TV guide for live sports (which can also send you to the nearest bar). Figuring out which apps and streaming services you need to watch live sports can be hard, and it's only getting harder. This year, 25 Major League Baseball games are exclusive to Facebook, while 20 Los Angeles Football Club matches and 18 Seattle Sounders matches are exclusive to YouTube TV. ESPN+ has the rights to certain rugby, boxing, and cricket matches, and Twitter is the exclusive source for live 360-degree video coverage during certain PGA Tour events. And that's on top of the usual mix of cable channels jockeying for major football, basketball, baseball, and hockey coverage. Bleacher Report Live might be able to help. 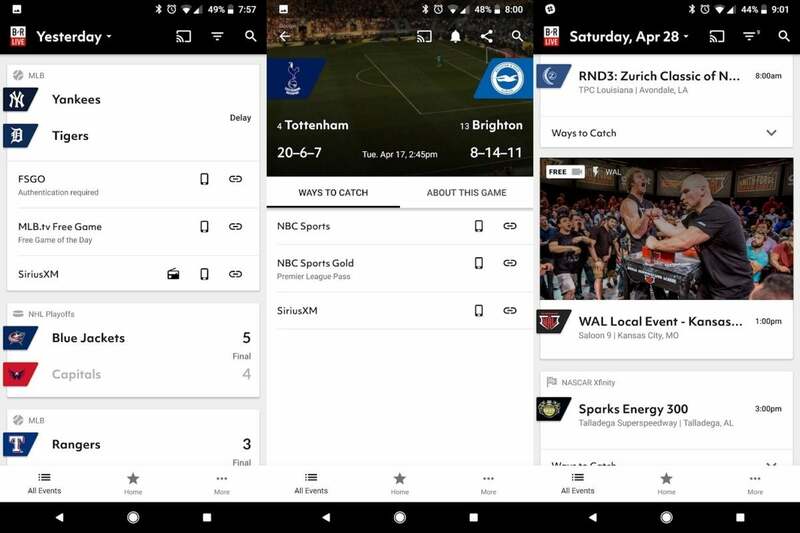 The free app for iPhone and Android lists upcoming games across multiple sports leagues, and tells you which streaming services or TV channels you need to watch them. And if you don't feel like paying for yet another subscription, the app will even direct you to the nearest bar where the game might be playing. It's a handy tool for cord-cutters as streaming sports rights become ever-more fragmented. Bleacher Report Live lets you search for upcoming games across multiple sports leagues. When you first launch the app, it asks you to create a login. (On Android devices, I would avoid using the Google sign-in option for now, because doing that can prompt the app to request your contacts list. Turner says this is a bug that it's investigating, and the company says it's not storing contact info.) You can then select some favorite teams whose games you'd like to be notified about. From there, you can look through a list of upcoming games, filter the list so that only certain sports appear, and search for specific teams or leagues. 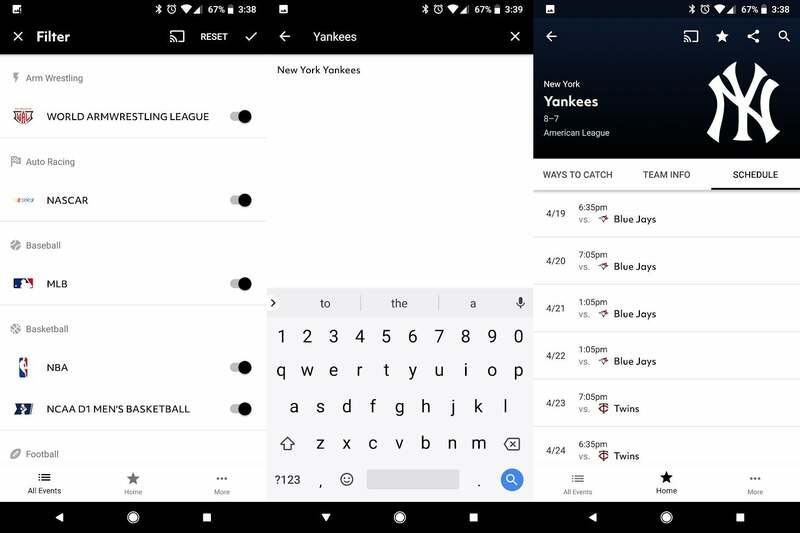 The app doesn't list everything--I didn't see any boxing, rugby, or cricket, for instance--but it covers all the major U.S. sports, lots of international soccer leagues, NASCAR racing, and even some offbeat sports like handball and arm wrestling. Once you've found something you want to watch, just tap the "Ways to Catch" button and the app will list the streaming services and TV channels where it's available. You can also sign up to get alerts when the game starts. Still, the app is surprisingly up to date on what's available through standalone streaming sources, including Facebook, Twitter, ESPN+, Verizon's go90 app, and league-specific apps like MLB TV. For the NBA Playoffs, it even lists TNT Overtime, the free streaming site that offers alternate camera angles and commentary instead of the main broadcast feed. Bleacher Report Live's game listings even include Facebook, Twitter, and local venues. As for bar listings, your mileage may vary by location. 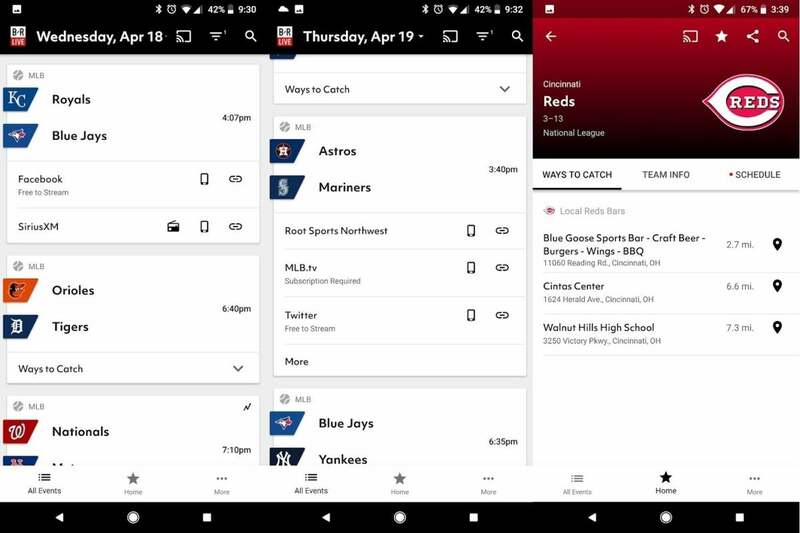 In my neck of Cincinnati, the app suggested one local bar for Reds games--I'm certain there are many others--along with a local high school and a college sports arena that most definitely do not have the games on TV. A Turner spokesman says the company relies on proprietary data for these listings, and is still improving them. My guess is that users in larger cities will fare better. When you're ready to actually watch the game, Bleacher Report Live will link you to the appropriate app. If you have Google's Chromecast dongle, and the app supports it, you can then start watching the game on your television. Bleacher Report Live also supports Chromecast directly for the small number of live sporting events that it offers through its own app. 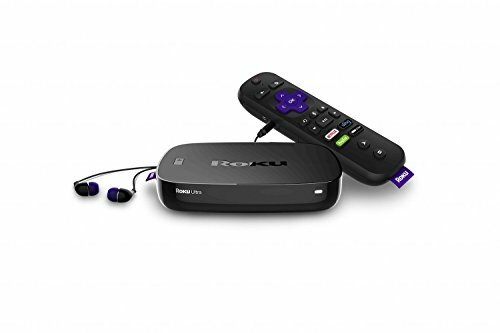 The app should become available on more TV devices this summer, Turner says. Bleacher Report Live is still in beta, so you can expect a few rough edges beyond the ones I've already mentioned. I've experienced a handful of random crashes, and for some reason soccer doesn't appear in the list of sports filtering options. On the plus side, Bleacher Report Live isn't charging for any of its own live games during this preview period, so you can help yourself to some free soccer and arm wrestling for at least the next couple of months. Although the launch of ESPN+ has stolen the spotlight over the past couple weeks, Bleacher Report Live arguably provides a better service to cord-cutters. While its live sports offerings are currently quite thin, at least it doesn't pretend that it's the only sports app that matters.